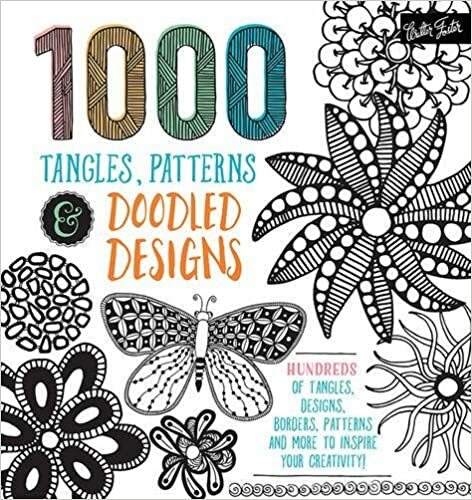 1,000 Tangles, Patterns & Doodled Designs combines hundreds of tangling, illustration, and doodling patterns and designs into one all-encompassing guidebook. Filled with inspirational designs, patterns, borders, flourishes, doodles, tangles, and more, this creative resource explores hundreds of ideas for tangling and doodling enthusiasts to learn and model. From basic tangles to stylized letters and numbers, the variety of patterns and designs seems virtually endless. Throughout the book, practical tips and step-by-step lessons help artists perfect their skills, while blank templates can be copied or scanned to use over and over again. A nonstop compendium of doodling tips and tangling techniques, 1,000 Tangles, Patterns & Doodled Designs is a complete resource for doodling enthusiasts and a tangler’s dream come true.